On this page, read an interview with Brian O'Rourke on the history of Irish pub songs. But first let's listen to examples. 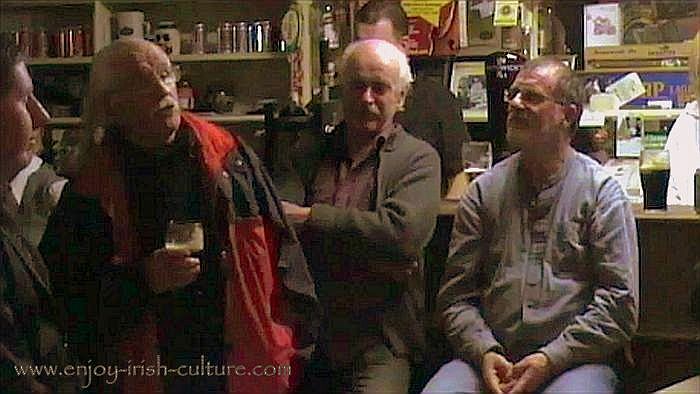 Watch John and Tim Lyons (second and third from left in the photo above respectively) perform a humorous Irish song, 'The Limerick Rake' at a singing session here and get an idea what the singing scene is all about! Watch Brian O'Rourke perform a traditonal song, 'Amhrán Mhuighinse', or the 'The Song of Mhuinse'. Mhuinse is a place close to Carna, close to the sea in county Galway. Brian translated this song himself from Irish into English to make it more accesible to the English speaking audience. This is a sad Irish song, a lament. Brian, tell us about the history of Irish pub songs. Where and when did people sing traditionally? It might surprise you to hear that so-called pub songs, in the old days, were not sung in the pub. Instead, Irish pub songs are part of a tradition of storytelling by the fireside. People used to visit their neighbours, friends and relatives in the evenings after work or on a Sunday after mass, sit with them by the fireside, and share stories. In between the stories there would be songs, usually unaccompanied. It was only in the 1960s at the onset of the folk revival, when singing moved into the pub scene. That’s when a lot of English language songs were made famous by bands such as the Dubliners and the Clancy Brothers. These bands would sing the songs accompanied by instrument, most notably guitar. Examples for songs that were made famous that way are The Wild Rover and The Wild Mountain Thyme. Out of many hundreds of Irish traditional songs, only a handful are such well-known songs. As for the remainder, there were a lot of traditional Irish songs that were not as easily suitable for accompaniment. These songs are not as well known, but stand in their own right and should also be kept alive. Those songs now also started to be sung as part of Irish music sessions in pubs, but, generally speaking, many singers were left frustrated with the lack of attention traditional Irish songs were getting there. In the pub, people are used to talking when the musicians are playing. Irish music often becomes a background affair. When an Irish pub song is sung unaccompanied, it can be a bit of work to enforce the necessary silence for the singer. So, Brian, what did singers do to make sure their songs kept being heard? What to do? From the 1970s on, all around the country singers started to form singing clubs or singers circles to cater for this more ‘homely’ type of traditional song, the type that needs a quiet atmosphere of listening and tuning in on the part of the listener in order to get the best exposure. One of the first pubs too host such singing sessions exclusively for Irish pub songs was the Góilín in Dublin. From the early 1980s on, singing clubs all around the country followed suit. The biggest and most notable clubs still in operation are those in Dublin, Cork and Ennis, and some smaller ones that come and go in other locations such as Galway, Athlone, Forkhill in South Armagh, Inishowen, and Roscommon, and in recent times in Nenagh, County Tipperary, in Offaly, and in Rosslare. Typically, singing clubs will hold sessions in a regular and predictable pattern such as the first Wednesday of the month. Brian, what are singing festivals and who organises them? As a highlight of their club year, some singers’ clubs will organise singing festivals pending funding from an organisation such as the Arts Council. There was a strong era of singing festivals throughout the 1990s and until the latest recession, notably the festivals in Derry, Forkhill (County Armagh) and Ballyliffin (County Donegal). At the moment, festivals are a bit more sporadic, but, for those who are interested, they still can be found. A singing festival will be a whole weekend featuring traditional singing sessions of Irish pub songs over two or three days. For those interested in traditional songs, they are a great opportunity to meet like-minded people and to exchange ideas. We love putting this website together for you and we hope you enjoyed this article about Irish songs which are such an integral part of Irish culture! We'd really appreciate a small bit of help from you- would you please kindly use any one of the social functions above left or below this article to tell the world about our website so that others may enjoy it, too. It will only take a few seconds of your time! Much appreciated! Thanks a million and warmest regards from Susanna and Colm.